Some deep-diving plugs will get down to around 30ft (10m), but it will take a downrigger set-up to get your lure down to greater depths. This is the crane-like device often seen on the sterns of sports-fishing boats. Its purpose is to deploy an independent line, taken to depth by a heavy lead weight. Your trolling line is attached to the weight by a quick-release clip, which releases when a fish strike your lure. The benefit of course is that you can get your trolling lure down to a much greater depth than you could otherwise achieve, without the encumberence of any weight on the line. A down rigger weight, or alternatively a Planer, to which your trolling line is attached by a quick-release clip. This can be the complicated bit - everything else is fairly straightforward. The simplest down riggers are manually operated. An ideal piece of kit for small fishing boats whose skippers realise the benefits of fishing a lure down deep. Sailboat skippers may baulk at all this machinery on the stern, just waiting to mix it with all the running rigging. But there are a couple of ways of getting an independently weighted line down without having your stern look like a construction site - click here to see how it's done. But if you've got a sports-fishing boat with power to spare, then an electrical version is likely to be attractive. As you'll have noticed, there's a considerable price difference between the two models - so if you're beginning to think this all looks a bit pricey, here's how to make a homemade down rigger outfit. The line to use is single-strand stainless steel wire. Heavy weight and small diameter it will achieve maximum depth with minimum drag. This is a lead ball fitted with a stabilising fin, all covered in a protective plastic coating. Weights are ranged between 4lb and 12lb. The down rigger line is attached to the eye on top of the ball, and the trolling line - via a quick-release clip - to the eye on the end of the fin. The Cannon Finned Down-Rigger Weights shown here sport a reflective strip on each side of the fin, although there would be little light to reflect at their operating depth. Downrigger planers like the Sea Striker Planer shown here are an alternative to downrigger weights. They're made from stainless steel and dive to depth because of their hydrodynamic design, rather than the forces of gravity. They're attached to the end of your down rigger line via the ring which slides along the bridle. Once tripped by a striking fish, they capsize and can be easily brought to the surface. Any sinking lures work well with this rig, particularly diving plugs which descend to depths well below that of the down rigger weight. 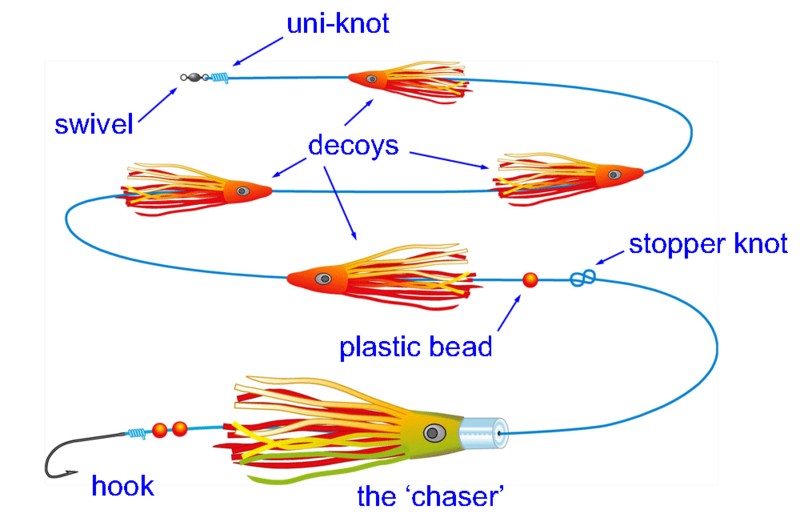 Lure colour is much less important when fishing deep, but 'noise' makes all the difference. Look for high-action lures with internal rattling beads and large spoons that transmit low-frequency throbbing vibrations.